Often, you'll find gain specified in differential-probe amplifiers at a system level. The probe should function as a unity-gain buffer, and the signal on the oscilloscope's display is a unity-gain representation of the signal you're probing. There are internal gain and attenuation stages throughout the probe's signal path. Inside of the differential amplifier, matching circuits align the impedances of the probe amplifier and the probe tip. Also, equalizer circuits are required to flatten the probe's impulse response. These passive matching and equalizer circuits have a nominal amount of attenuation. The amplifier adds back gain to compensate. When the voltage range of the oscilloscope decreases to make higher-sensitivity measurements, the differential probe's gain must increase to bring a small signal to the full-scale range of the instrument. Consider a vertical setting of 10 mV/div, which is a very sensitive setting. The dynamic range of the probe is somewhat lower. Thus, the gain of the probe has to be higher to bring a small signal into the range of the oscilloscope's input voltage. If the oscilloscope voltage range were 100 mV/div, that implies a relatively higher dynamic range at the probe input, which means the probe doesn't have to provide as much gain and can be at a lower gain setting. So you want to apply as little gain as possible in the probe amplifier to bring the signal into the full-scale range of the oscilloscope. Of course, where there is gain, there is also noise. When you have a differential amplifier, that means an additive amplifier path in the signal chain and thus some additive noise. Ideally, you want to introduce a minimal amount of noise from your probe, but there are tradeoffs between gain and noise. The reality is that the more gain we have to apply, the more noise we generate at the amplifier's output. So if we have a low V/div setting for probing very small signals, the noise becomes the dominant factor. Some oscilloscope vendors might specify the probe-only noise, but what's really important is the oscilloscope + probe noise. That system signal-to-noise ratio (SNR) is what will actually be displayed on the screen when you make measurements. Bear in mind that you may have a relatively low amount of noise referred to the input, but once that noise propagates through to the amplifier's output and is multiplied by the probe's gain, it's also going to pass through the oscilloscope's front-end amplifier. So we need to ensure that the oscilloscope + probe SNR is adequate for a given application. Figure 1 depicts some noise comparisons between a Teledyne LeCroy D1605 probe and a competing model. The D1605, a 16-GHz probe, is represented by the dark-blue line. The X axis is the gain range in V/div of the oscilloscope, and we find that at very sensitive settings, the probe has to apply a high amount of gain. The SNR is low as opposed to when the oscilloscope is set to a fairly low sensitivity; then, the probe has to apply very little gain and the SNR is relatively high. We must also consider the sensitivity of the probe itself. 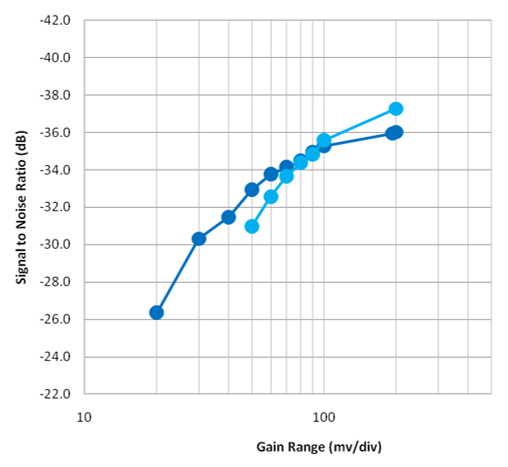 Some probes don't provide enough gain to enable high-sensitivity measurements. The competing probe, shown by the light-blue line in Figure 1, can't really extend below 50 mV/div, where it lacks the gain to bring the signal within the oscilloscope's full-scale range. So in addition to the noise, there's the concept of sensitivity, which is determined by the gain of the probe and how much gain is available.